Prada’s Technicolor Fall – One of the most highly anticipated shows of Milan Fashion Week, Prada, presented its fall 2012 collection on Thursday. Miuccia Prada placed focused on modified pantsuits, tailored coats and graphic prints for the new season. 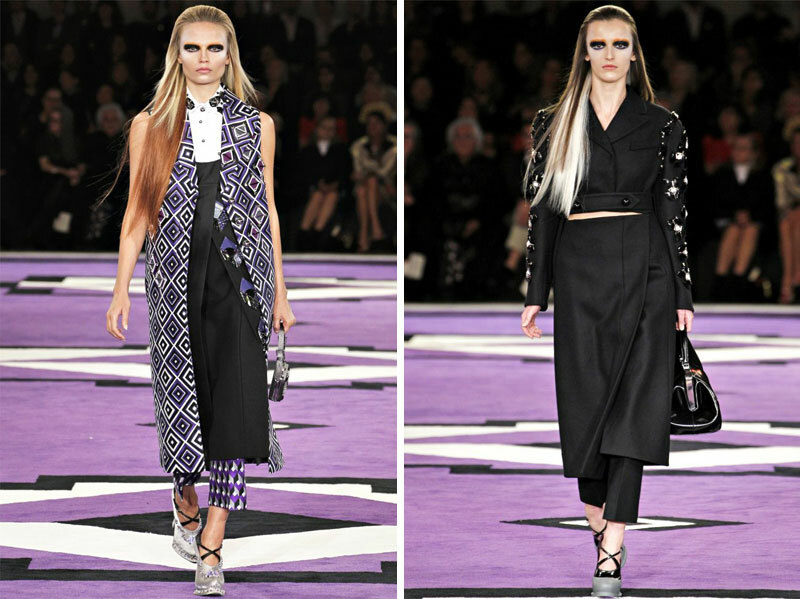 Opening with stark black looks, the Italian designer embellished coats and pants with beads or large jewelry pieces. As the collection progressed, color was introduced in the form of geometric patterns ranging from deep purple to orange marmalade. Moving on from last season’s pastel hues, Prada reinvented sixties staples such as long vests, tailored suiting and platform heels for the modern woman. Beauty for the show was almost as bold as the clothing itself, with models sporting ombre hair and smokey raccoon eyes for the new season. I like some looks here and there but most of it is way too repetitive for my liking and I agree with the comments above, they look pregnant.